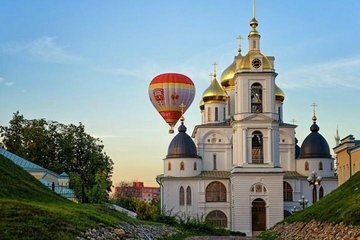 Admire the historical Russian city of Dimitrov, founded in the year 1154, on a hot air balloon ride with transport from Moscow. This private tour provides the chance to float through the air on a 60-minute balloon flight, looking down on the picturesque landscape outside Moscow. A glass of Champagne and a certificate are included to celebrate your adventure. We were picked up at 4am for our hot air balloon ride over Dmitrov. Flight was a spectacular. We flew through a ravine, skimmed the tops of trees so you could pluck off branches and dipped the basket into a lake, all things that would not be permitted in Canada. Absolutely amazing. Air was so fresh and scent kept changing from the fields to the forest to the lake, and the scenery was beautiful. First flight certificate ritual after the flight was nicely done and champagne was a nice way to cap off the experience. Only drawback was the tour promised an air conditioned coach, and instead we had 5 people crammed into a small, hot Volkswagon sedan. This car even got stuck in the mud in the field where we got picked up and we had to help to push it out. One of us got totally covered in mud while doing so. Tour was also to include: 1. Dmitrov City Tour 2. Admission Tickets to the Dmitrov Kremlin and 3. Three course Russian lunch. It came as a great surprise to us to learn that we were being driven straight back to Moscow after the balloon ride was over. The driver claimed to have no knowledge of the the other parts of the tour and said he was instructed just to take us straight back. When I showed him the voucher, he said if we stayed in Dmitrov the traffic would get too bad. I highly doubt after lunch traffic would have been worse than coming back as we did in the middle of morning rush hour. In fact traffic was so bad at that time that rather than being dropped at hotel we were dropped at end of the metro line where we had to buy tickets. Essentially we only got 1/2 the tour promised, but afterwards Viator did give us a 50 refund.